Great Stirrup Cay is a small island in the geographical center of the Bahamas, owned since 1977 by Norwegian Cruise Line. 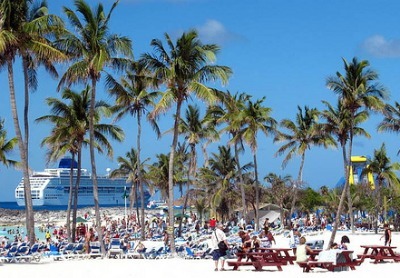 Since that time many have enjoyed the peaceful, remote island as part of an exciting NCL cruise, and for those wanting an out-of-the-way-destination and the feel of having their own private vacation spot, Great Stirrup Cay is an obvious choice. Its coral and limestone formation and breathtaking white beaches make this a truly memorable stop on a Caribbean cruise, away from the hustle and bustle of the larger cities and tourist attractions. NCL ships arrive at Great Stirrup Cay and remain anchored offshore; passengers are ferried to the beaches in a specially designed LT-1 landing craft. On arrival visitors can go immediately to one of the shops or restaurants constructed near the waterfront, or are free to relax and explore. NCL has a strict schedule for arrival and departure of the landing craft, so access to and from the ship is limited during the day. Because of its remote location and uninhabited spaces, the island is perfect for leisure and exploration. The sand beaches stretch far to the north and south of the main landing area, and visitors will find numerous plant and animal species in their native habitat. Lizards, land crabs, iguanas, great snowy egrets and even arctic terns are seen at Great Stirrup Cay on a regular basis. The beaches are lined with majestic coconut palms and there is an abundance of marine life to be explored beneath the gentle surf. One of the highlights of a visit to this island is the ability to rent snorkel gear for the entire day, complete with lessons for those who have little or no experience. NCL's Dive-In programs also includes paddle boating, parasailing, kayaks, 2-person sailboats and special boogie boards with underwater viewing. A live Calypso band is usually on hand to perform day and night. There are two full service bars near the beach, an island barbeque restaurant that offers up chicken, hot dogs, pizza, salads and a wide variety of fruits, and full restroom facility, all located near the landing craft arrival area. Food is served buffet style and is available throughout the day. Beach chairs and umbrellas are available for those who want to take their food to a private area. Most of the organized activities at Great Stirrup Cay take place near the landing area, but there are a number of things to see and do simply by walking. 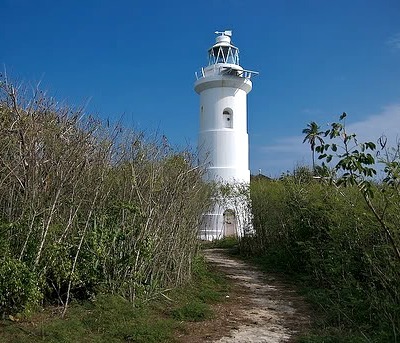 Nature trails take visitors to the center of the island, and the nearby building remains from a one-time U.S. military installation and satellite tracking station are within easy reach for the curious. A special jogging path is located near the restaurant area and the new beach volleyball courts and games area is also only a few minutes walking from the landing zone. Access to the island is restricted to passengers enjoying a Norwegian Cruise Line vacation, as the company owns the property outright. There are no banks or traditional stores located on the island, although cash sales are allowed for certain items bought at the Straw Market shops located on the beach. The beach in Great Stirrup Cay. The place where cruise travelers spend most of their time. The lighthouse of Great Stirrup Cay, originally built in 1863. Lunch time on the island. 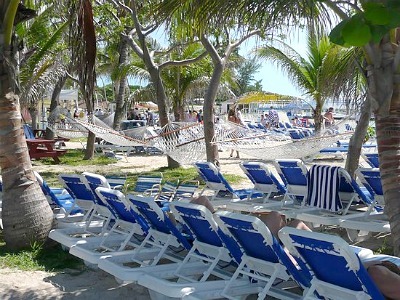 There are many hammocks on Great Stirrup Cay beach that you can use to relax and to sleep.